Bulk SMS Professional Bundle includes Bulk SMS Software- Professional and Pocket PC to Mobile SMS Software. 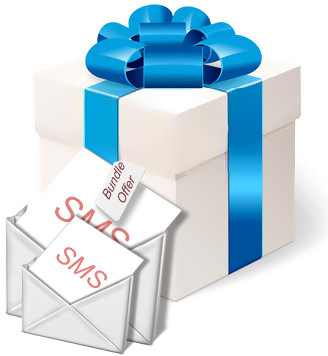 You can purchase bulk SMS professional bundle pack at an affordable price. Professional bulk SMS software sends bulk sms from PC using Windows and GSM technology based mobile phone. Pocket PC to Mobile bulk SMS software composes and sends thousand of text messages from your Windows based pocket PC . SMS gateway program successfully delivers standard messages and notifications over national or global mobile network within few easy steps. Group SMS software quickly sends promotional campaigns, product launching details, share market updates and other personalized SMS across the world in less time. SMS gateway program control and customized load of bulk SMS over worldwide location while sending group SMS to individual or list of contact numbers. Text messages sender software supports all Unicode characters to send unlimited text messages in different languages. SMS broadcasting program provides option to save sent text SMS details in txt or html file formats which can be easily viewed by users whenever requires. Pocket PC to Mobile bulk SMS software broadcast group text messages using pocket PC mobile phones. SMS sender program provides option to import phone number from phone memory during bulk SMS sending procedure. Now you can easily sends unlimited text messages simultaneously to your national or global mobile network within minimal time using pocket PC to mobile bulk SMS software.